It sounds great, doesn’t it? Going on interdimensional adventures, blasting dangerous aliens with your laser gun, narrowly escaping perilous situations—you just never know what sort of things are going to happen when you live like Rick and Morty. 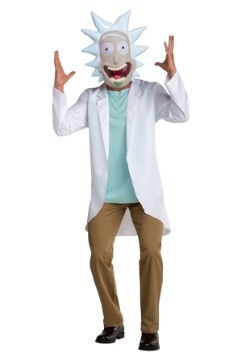 Well, with our selection of Rick and Morty costumes, you can get one step closer to your dream of interdimensional travel. 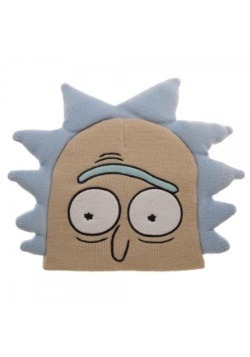 We have Rick Sanchez, Morty Smith, Mr. Meeseeks, Pickle Rick, and more! The television of 2013 was a wild ride, wasn’t it? Sharknado had just happened for the first time, showing audiences that there was indeed something more frightening than a lone great white shark at the beach. Breaking Bad was coming to a crashing end, and most importantly, Rick and Morty began airing on Cartoon Network. 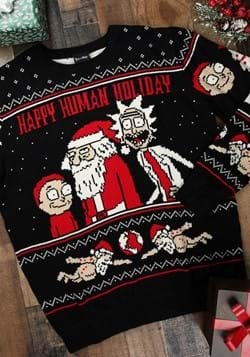 The wacky adventures of the grossly irresponsible Rick Sanchez and his neurotic grandson, Morty Smith, became an instant sensation. We’ve been watching since the start, which is just one of the many reasons that we decided to put together the largest collection of costumes based on the cartoon duo. First up, let’s talk about Rick. He might look a little like Doc Brown from Back to the Future, but don’t let that fool you for a second! He’s one foul-mouthed scientist with an ego the size of an elephant. He’s the one responsible for the portal gun, the love potion, and many other genius inventions. 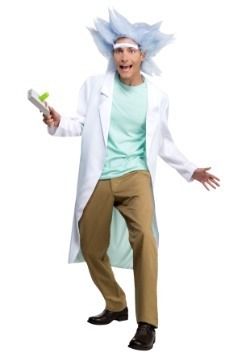 If you’re a huge fan of the raucous scientist, then you might want to try one of our many Rick costumes for your Rick Sanchez cosplay. We carry sizes for both kids and adults, but that’s not all. 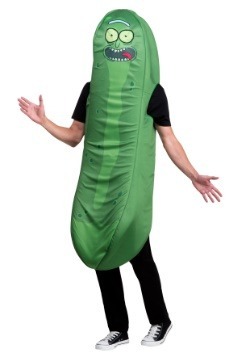 We even have a Pickle Rick costume that transforms you into the briny character from season 3 of the show. Not everyone falls into the camp of team Rick! 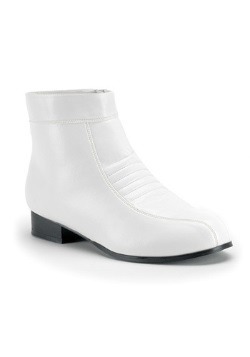 No sir. 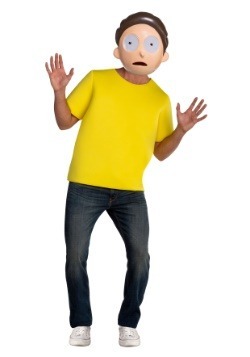 Some of us are more of a Morty. 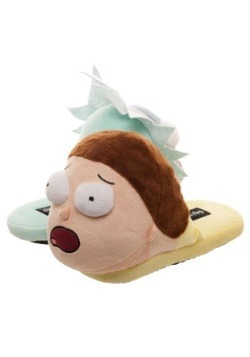 Really, most of us are more of a Morty. He’s a somewhat soft-spoken teenage who just wants the courage to be able to talk to girls, and he often gets dragged into all sorts of messes with his reckless grandpa. That’s super-relatable and if you feel creating a Rick and Morty cosplay of the character, then try out one of our many Morty costumes. Don’t even think that we’re going to skip talking about Mr. Meeseeks! The enigmatic blue creatures have one goal… to finish whatever goal you give them when you summon them with a Mr. Meeseeks Box. 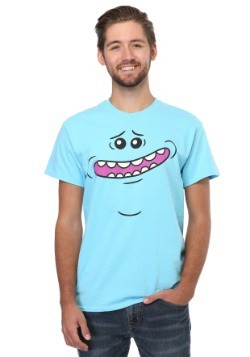 You can cosplay as a Mr. Meeseeks too when you use one of our Mr. Meeseeks costumes. 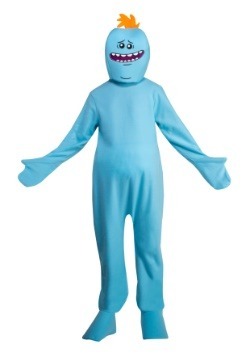 We have casual styles, costumes for adults and even a kid’s Mr. Meeseeks costume. 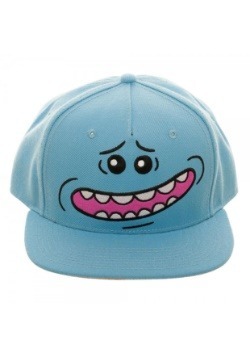 Finally, make sure to accessorize your look with one of our many Rick and Morty accessories. 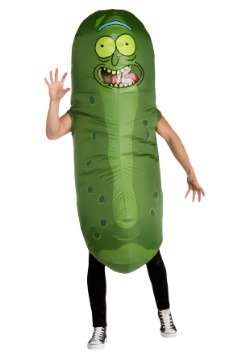 From Rick’s portal gun, to his laser pistol, you can find something to really take your costume over the top. 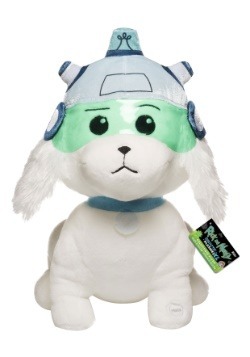 You can even fin a Snowball plush to help you recreate scenes from one of the very first episodes of the series. 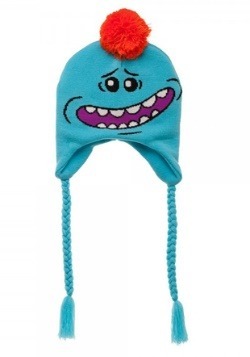 We also carry easy cosplay items, like hats, sunglasses and buttons to help kick-start your Rick and Morty fashion!